Celebrating an employee’s anniversary is an important way of letting him or her know that you appreciate the commitment that they show to your company. If the employee has been with the company for an extended length of time, (such as 25 years) a fantastic idea would be to have a dinner or party in the employee’s honor. At the party, the guest of honor can be presented with their anniversary gift. 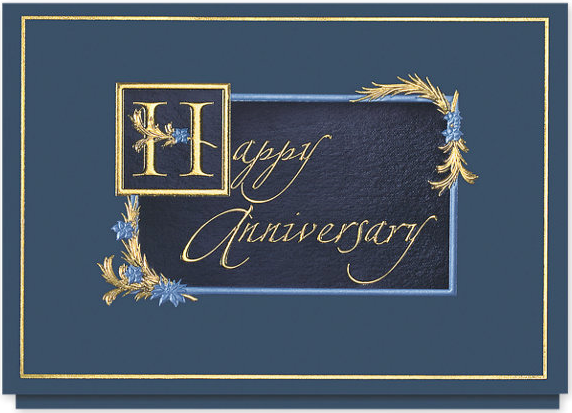 In addition to a gift, it’s always smart to circulate an anniversary card through the office so the entire staff can sign it and pass along their good wishes. Of course, anniversaries can be celebrated for shorter milestones, such as 5, 10, 15 or 20 years. Many companies present employees with a catalog of gifts they can choose from. This may be less personal, but it ensures that each employee is getting a gift that will prove to be useful. Tickets to a sporting or music event—A great choice for someone who has a devotion to a specific team or band. This will provide your employee with wonderful memories for years to come. A personalized or engraved plaque or trophy—This could be something the employee displays at home or in their office. Jewelry—Diamonds are a girl’s best friend, but any nice piece of jewelry will make an employee feel appreciated. A watch—Although a watch is technically a piece of jewelry, it deserves a category of its own because it’s one of the most well known, classic corporate gifts. The reason? It serves as an important symbol of the years of connection between the company and the employee. Often, the watch can be engraved or have the company name on the face. Small Kitchen Appliance—A coffeemaker, blender or toaster. Any of the everyday kitchen conveniences can be given as an anniversary gift. While it may not be what someone thinks of when they think of a special gift, it is practical! A golf club or set of clubs—Golf enthusiasts are always looking to improve their game, and nothing makes them happier than a specially selected club. This could also be personalized to make it more special. A “Foodie” gift—This could be anything related to food. A basket of gourmet chocolates, a gift certificate to a restaurant, an expensive bottle of wine, or a subscription to a fruit of the month club. Foodie gifts are usually a great choice because almost everyone loves to eat. They also have the benefit of being appealing to either gender. A “Techie” gift—There are so many different computer gadgets out today, there could be a top ten list of technology related gifts of their own. We all know someone who has to have the newest model of everything. A techie gift would be the perfect choice for them. Some ideas are: the latest tablet, e-book reader, video game console, or Smartphone. A contribution to a charity or a cause your employee supports—You really have to know your employee with this one. Not everyone welcomes a gift to someone else with open arms. A charitable employee who is always giving of their time might find this to be the perfect gift. A gift card to a store that the employee is known to frequent—Although some people may not think a gift card is as personal as an actual gift, if you know your employee loves basketball, a gift card to a sporting goods store is a great idea. I agree with all the aboe suggestions, however, favor number ten. A gift card to a store that the employee is known to frequent is a sure thing. I have a friend who received a cheese-of-the-month club membership for her 10 year anniversary at work. I was so jealous; although my company did give me a 1 year subscription to monthly cooking magazine which was still pretty nice. A watch after 15 years would be a nice gift.